Langkawi, an island 1 hour flight North West of Kuala Lumpur. It’s so far up North that you can see Thailand across the shore. It offers a big variety of nature such as lush mountains, soft white sand beaches, and Mangroves buzzling with wildlife. 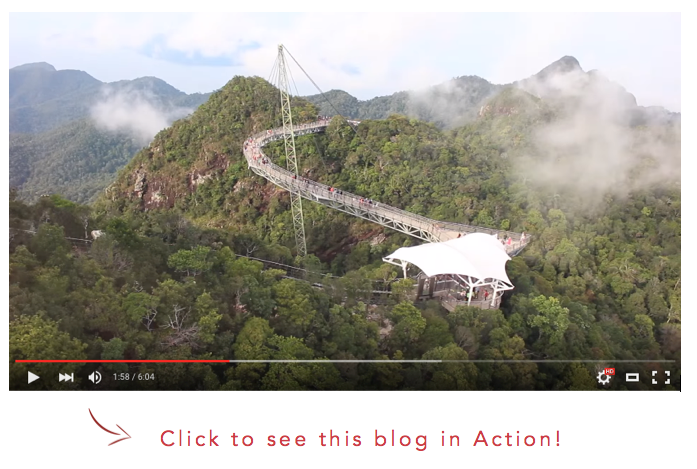 We were staying at Berjaya Resort, which was a 15 minute drive from the airport, and right beside the Cable Car up to the Sky Bridge. They have over 400 private beach bungalows for all guests and some are in the trees and some are by the sea. One of the reasons I choose Berjaya Resort is that they also provide a lot of tours you can book once you are there, which gives a lot of flexibilities and options for fun. I e-mailed their reservations front desk and they gave me a complete list of 70 activities & tours for land, sea, beach, and indoor activities. 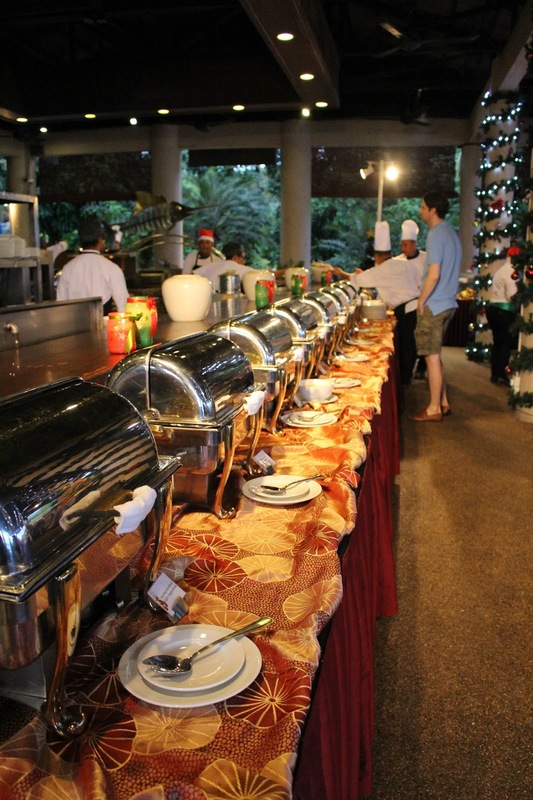 Within their massive villa park, they also have 5 restaurants (Malay/Thai/Japanese/BBQ/Beach), 1 lounge, 2 bars, and 1 sports bar for you to choose from. After checking in, you’ll be directed to the resort shuttle desk. Because it’s such a massive resort, they provide shuttle service to your room. To be fair, I was staying at one of the furthest bungalows in the resort, but it was around a 15-20 minute walk from the front desk lobby. Plus it was a very nice walk with trees on one side and the ocean on the other. I ended up booking a Mangroves trip for the following day. Bu for the rest of the first day, it’s time to head up to the Sky Bridge! 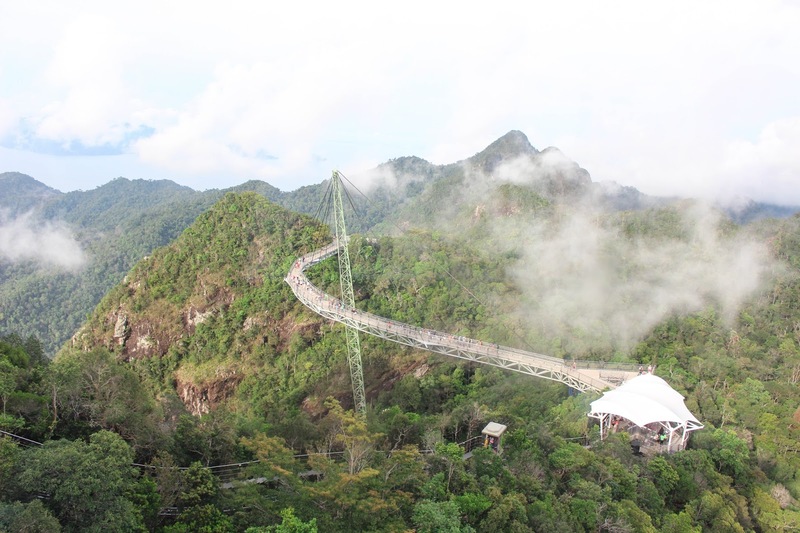 The Langkawi Sky Bridge sits on the Peak of Gunung Mat Chinchang. 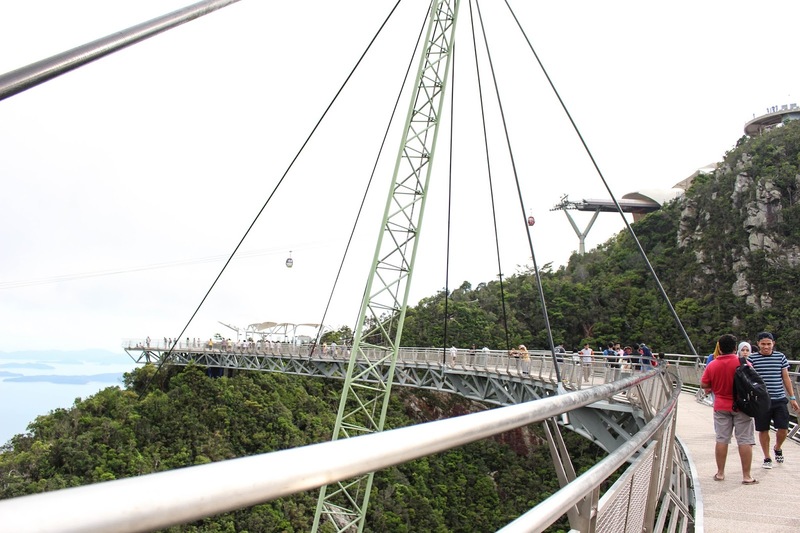 It can only be reached by the Langkawi Cable Car which comes in 3 different sections with the bottom station, station 2, and top station. The queue was massive even though it was a weekday and a non-holiday. Instead of paying MYR 35 and waiting in line for hours, we decided to pay for the express tickets for MYR 70, which is worth skipping a 3 hour wait. You’ll also need to pay a RM5 fee for accessing the Sky Bridge, and we also opted for the Sky Trail which is a guided trek from the Top Station to Station 2. The view is spectacular. 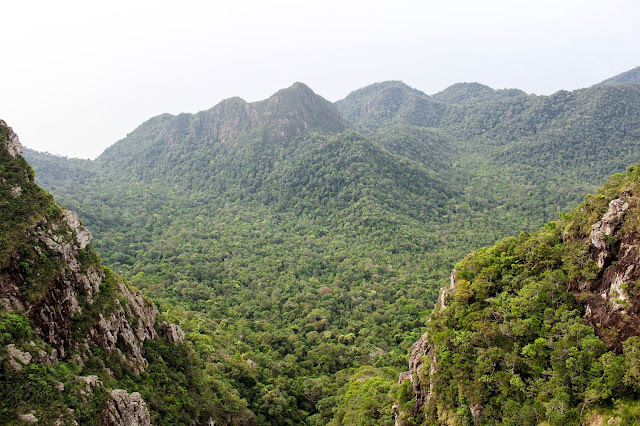 The mountain is covered in thick tropical rainforest trees and in the distance you can see the ocean. The Sky Bridge has see-through glass panels along the bridge. That’s a 660m scary drop down. Our trek guide took us down some narrow stairs and we disappeared into the thick forest. You could see some insects but not many other animals. They are probably hiding because of the cable car noise disturbance as well as water pipes running down the mountain. All in all it was still a great walk down to station 2. They guide was very helpful and pointed out a lot of trees and interesting rock formations. By the time we got down it was early evening. We opted for the Thai restaurant floating on the ocean. It was very quiet in the resort and there were very little light and noise pollution. We dined in the moonlight and only heard the clinking sounds of plates and utensils while people chatted quietly over their dinner. 7am, I was up and ready for our Mangrove Tour. It was a full day tour for only MYR 160 per person for a shared tour. The agenda was from 8am to 5pm. 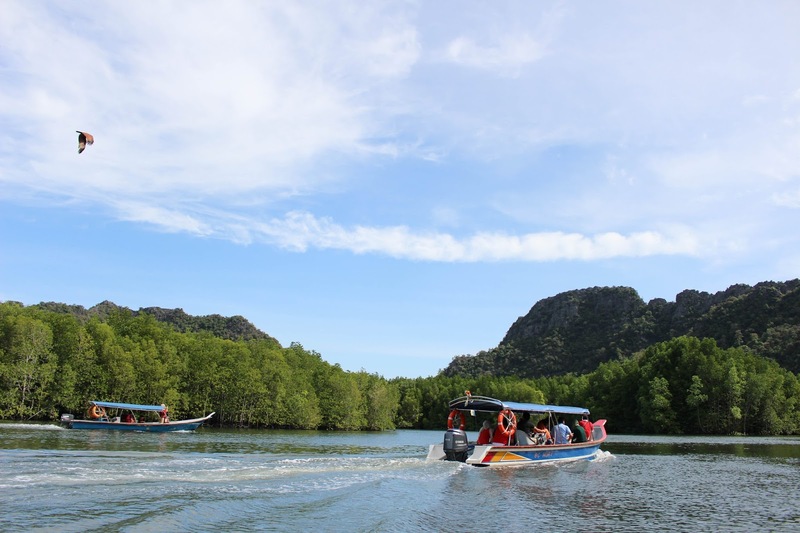 First we have to drive from the west side of the island to the North East corner where the Mangroves are, then it’s a boat ride to see fishes, monkeys, bat caves, a stop at a floating seafood restaurant, and finally arriving on a white sand beach. The car ride lasted almost an hour, and we were sharing rides with a Belgium Family. The Father was working for a flooring company and was sent to Asia for sales. He had a really cheerful attitude and the car ride was a pleasant one. Upon arriving the pier, we were notified that there was another 1 hour wait, this was because they were busy loading the boats with gas, ice, water, and some items that will be used to feed fish and monkeys. 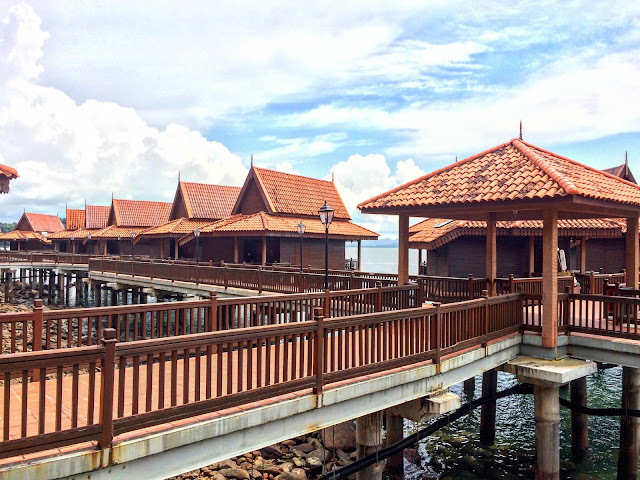 The pier reminds me of Ha Long bay, with many tall limestone islands in the distance. The water was very calm and was covered in dozens of boats that fit around 20 people per boat. We were paired up with 2 Cantonese Families, a Filipino family and the Belgium family we shared our car ride with. There was a captain on the boat and as well as a local guide. Our first stop was Fish Feeding! 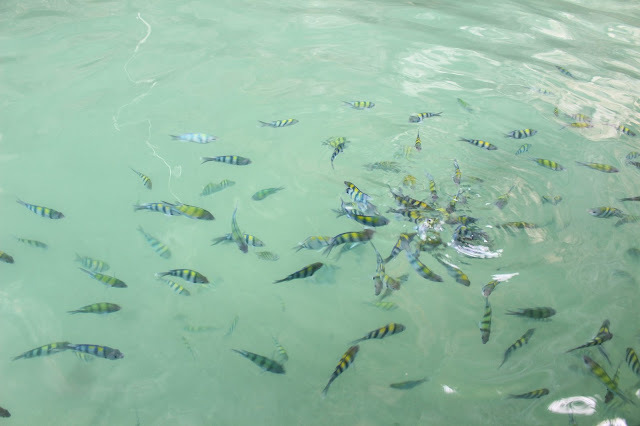 The water was crystal clear and we were given some white bread to feed the fish. Because the fish was a black and yellow striped, it was called the “Sergeant Major fish”, pretty cute name right? 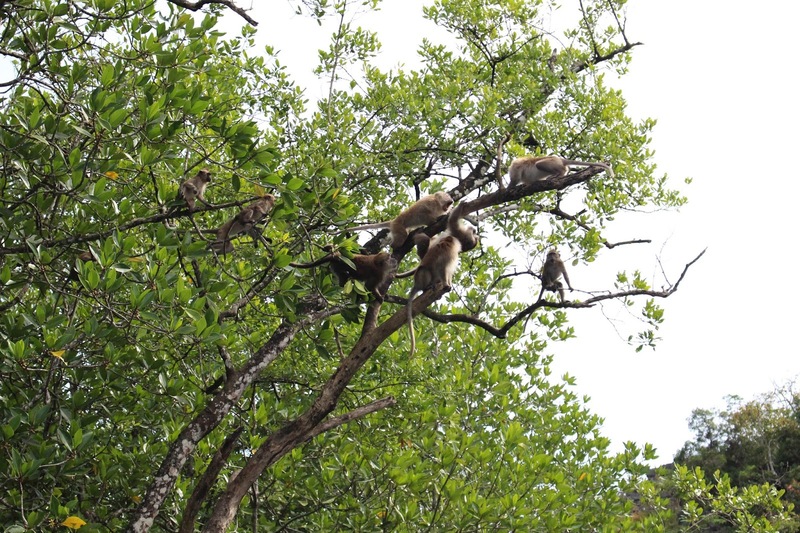 We continued getting closer to the Mangroves and ran into some Monkeys on the shore. “These monkeys are the friendly ones, you can feed them if you want!” said the Captain while he threw peanuts in the water. The little long tail monkeys swam with grace across the water and stuff peanut after peanut into their mounts, and held as many peanuts they could in their little palms. Suddenly a big monkey with muscles leaped into the water. He was the leader of this group. It startled me a little, but he was still very friendly. A little deeper into the mangroves, but it was still a good 7 meters wide from coast to coast. There were Eagles diving swiftly into the water, effortlessly capturing fish. These eagles are the White-bellied sea eagles, they look more like large seagulls with an eagle’s beak. During mating season, the female eagle will choose a branch and keep it in her beak. The males will chase and fight to catch up with her. Once the female eagle has chosen a male partner, they will then fly together for kilometers undisturbed to find a suitable place to nest. Each pair of eagle only bears one baby. As we sailed deeper into the mangroves, the shores closed in, with less than 1 meter on each side. The right and left shore had 2 opposing clans of long tailed monkeys. If one were to cross the shore, they would be chased back. Up on the tall branches of the tree on the left side, we saw a group of monkeys closing up on one monkey at the very edge of the longest branch of the tree. It was directly above the water. After what looked like a staring contest, the single monkey attempted a strike but was immediately attacked back by the hoard of 10 monkeys protecting their territory. 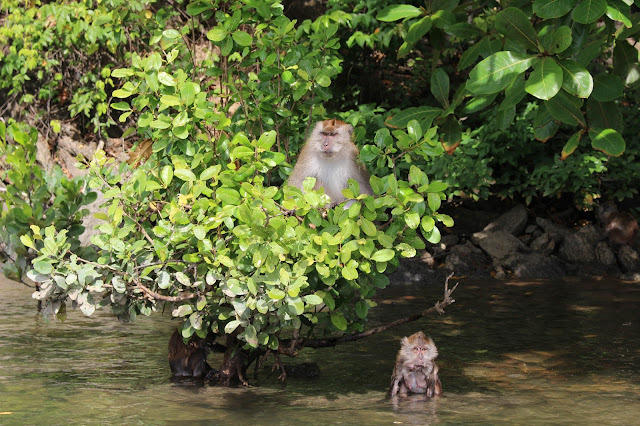 It slipped and plunged into the water beneath, and the 10 other monkeys jumped in the water after it without hesitation. 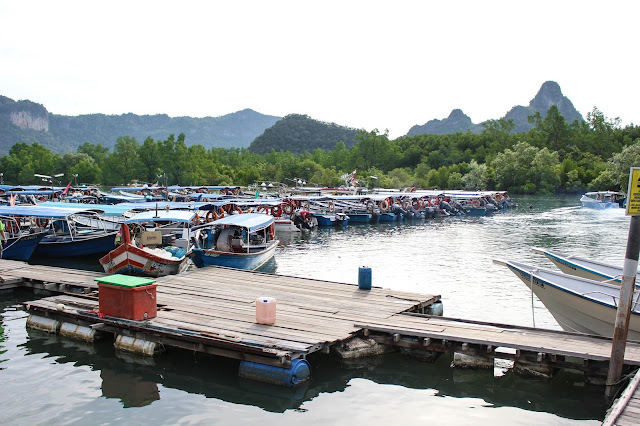 Before going to the bat caves, we stopped by a floating fish market/restaurant to order or lunch for later. You can pick fresh fish and crustaceans and they will cook it during the hour we are at the bat caves. The caves were just a 5 minute boat ride further in the mangroves. Only the guide had a flash light and the cleaning was very low. It was pitch black, and I couldn’t even see my own hands. I could only rely on the railings and my hearing of people’s footsteps in front of me. A few meters into the cave, the guide gave a flashing signal, and started pointing his light up at the ceiling. There hanging upside down in were hundreds of tiny bats. They looked more like black colored butterflies. 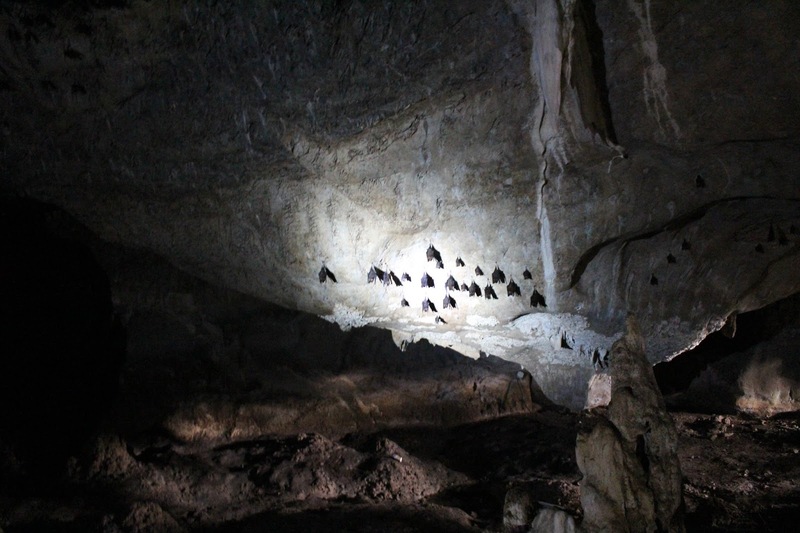 These were fruit bats so they were smaller than usual bats. It’s good to know I’m not risking to be bit in the cave. After a hearty meal back at the fish market, we journeyed back to where we started. 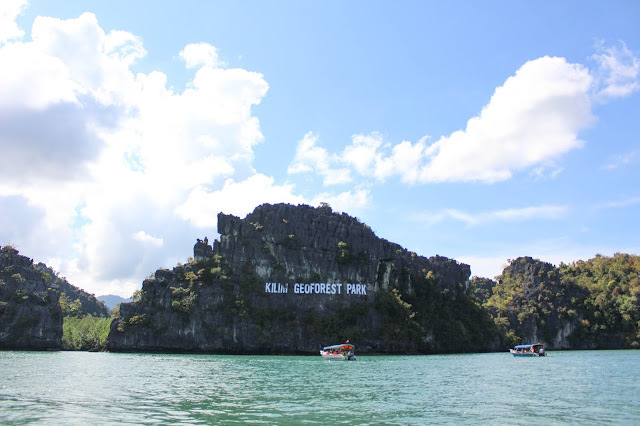 We passed by the “Hollywood” of Langkawi, which were big white letters stuck onto an edge of a limestone island edge which said “Kilim Geoforest Park”. Back at the shore we stopped at a white sand beach for a quick swim. It was good to be in the water since it was a good 30 something degrees outside. I was exhausted from being in the heat all day, but at the same time satisfied at this fulfilling experience. It was Christmas Eve tonight, and we had reserved ourselves spots at the Berjaya resort’s Beach Restaurant which was serving a BBQ buffet that evening. They were grilling the food fresh as it was being served, and it was a real feast with steak, roasted chicken, turkey, lamb chops…. As well as many different types of seafood and vegetable dishes. There was also a tower of fruit carvings, one of which was Merry Christmas and Santa carved into a watermelon. Beside that was a table full of desserts: cakes, biscuits, pudding and all that. It really felt like a Christmas Feast. 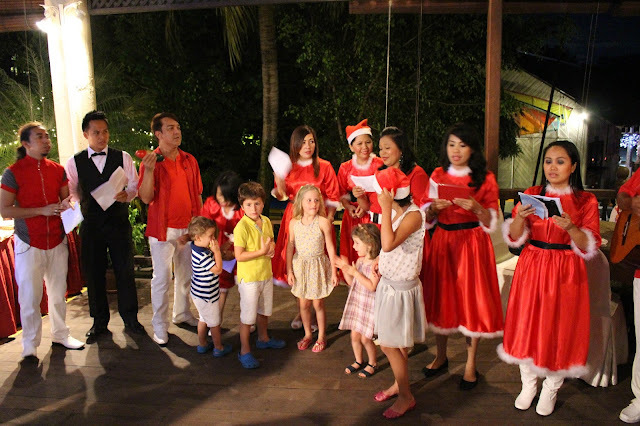 Halfway through dinner, a group of resort employees dressed in Christmas outfits came in and started caroling. They were soon joined by all the kids of the families that were dining at the beach restaurant. There was also a Santa handing out some candy canes to the kids! That really made the atmosphere of the evening, everyone was so cheerful. After dinner we took a stroll along the quiet beach side. A bonfire seemed to be set up but it was late and we were tired, so it was time for bed. 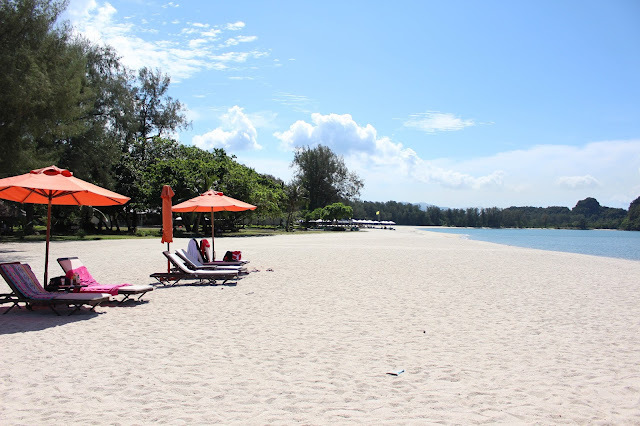 Christmas Day was a very sunny day in Langkawi. After breakfast, we hurried to the airport, and were soon on the next flight to Lombok, Indonesia. Follow the journey while we Trek 2,600 meters up Mount Rinjani in Lombok in the next blog.